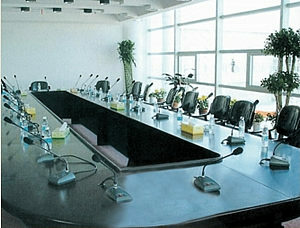 The portable units are useful for Board meetings or Enterprises where the discussion units provide microphone and fold back facilities to the committee members . The auxiliary microphone input allows an “audience – response” – microphone and telephone interface to be added. The central unit provides an output to the House PA System. The various fixed type units provide a ready made basis for custom Boardroom applications. The electronics package can be mounted remotely to permit any speaker configuration using custom panels built into the furniture. 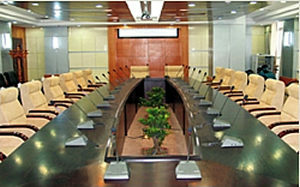 Portable System : The portable systems are used in multipurpose rooms where the furniture is movable or where the room is only occasionally used for conferences. In purpose-built venues, a permanent cable network may be fixed in floor ducting or in the furniture with Delegate units plugging into the network wherever convenient. Most smaller Meeting Rooms are used for open discussion and participants are usually allowed free access to speak in all but the smallest rooms, speech reinforcement desirable and it is preferable that this is effective but unobtrusive and uses a distributed loudspeaker system. 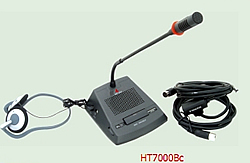 The Automatic Discussion System offer very convenient solution. In multi-purpose rooms the portable units can be quickly set and connected without the necessity for a technical skills. The individual loudspeaker built into the microphone units provide l sound reinforcement and the central unit h audio outputs for recording. The self-cancelling facility is a us extension of the normal manual switch mode which automatically switches off microphone when the speaker has finished.